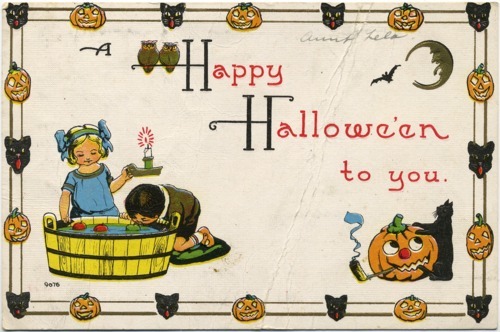 Embossed Hallowe'en postcard depicting a girl and boy bobbing for apples, inside a decorative border of alternating jack-o'-lanterns and black cats. Printed Hallowe'en greeting on front, and handwritten message on back addressed to Philip Hambleton of Topeka, Kansas, from Aunt Lela. Elaborate color postcards were popular during the early 20th century. This example was manufactured by S. Bergman of New York.